The Association of Specialists in Applied Biotechnology – ASBA is to be considered as a non-profit, non-governmental and apolitical association, financed by internal and international research and development grants and by different business sponsorships. 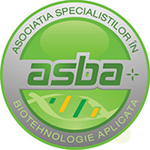 The Association of Specialists in Applied Biotechnology – ASBA was created with the main purpose of contributing to the progress of applied biotechnology with all its aspects which involves scientific research, innovation (meaning the academic programms in the graduate and post-graduate education) and some commercial companies from Romania. a) Research, design, implementation, consultancy, and solution testing, technology and information transfer with the aim of accomplishing the targets established by the Association of Specialists in Applied Biotechnology - ASBA. b) Publish the research rapports, articles, monographs and other paper works resulting from a research activity within the platform BioAliment. c) Collaborations and associations with similar organizations, with various individuals or legal persons from Romania or outside the borders. d) Besides the above mentioned forms of activity, the Association will engage itself in other activities which will allow and concede the opportunity of achieving its targets. The Association can set up commercial companies. The dividends gained by the Association as a result of these commercial companies, if they’re not to be reinvested in these priory mentioned business enterprises are redirected for the accomplishment for the Association’s established targets. The Association can evolve any economic activity with an auxiliary character that is closely connected with the legal person’s main purpose. e) The Association will have its own bank account at one of Romanian Commercial Banks. f) The Association’s funds will be solely used for the professional activity in order to accomplish the established purposes. g) The taxable year begins on the 1st of January and ends on the last day of December. The first taxable year starts in the moments of the Association’s setting up. Art.3 The founder members express their will to conjunct through the signature on the Constitutive Act and Status. Art. 4 The purpose of the Association is to fructify the scientific potential the specialists in biotechnology have with involvements in basic and applied research, technological transfer, the elaboration of new educational and applied programs, with a social and scientific impact on industry, agriculture and environment. Art. 5 The Association is set up under the name: The Association of Specialists in Applied Biotechnology – ASBA, with the headquarters on the 45 Portului Street, Mures building, Sc. A, 3rd floor, ap. no. 33, 800025, Galati. The Association’s name was registered in the records of the Justice Ministry and can’t be used by any other Romanian legal person.